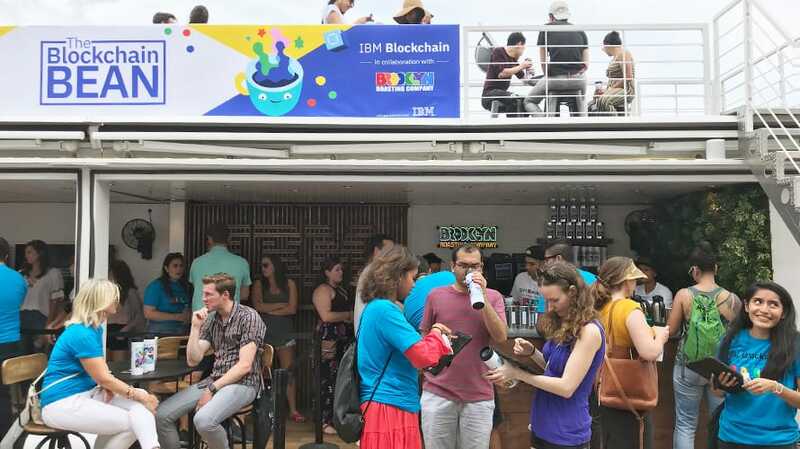 IBM: Brooklyn Roasting Co.’s pop-up at Smorgasburg offered customers a chance to track their coffee beans on the blockchain. This past Saturday at Smorgasburg, an open-air market in Brooklyn, N.Y., a dozen or so people in their mid-20s and 30s queued inside a large shipping container, which had been cut in half, that served as the location for a pop-up coffee shop hosted by Brooklyn Roasting Co. So far, none of this should be surprising, considering Brooklyn’s love of food and coffee. Nor should it be surprising that in the age of pop-up shops that there would be a coffee pop-up amid the 100 local food vendors who feed between 20,000 and 30,000 visitors every Saturday during the summer months that are looking to sample creative cuisine. What makes this one different is that Brooklyn Roasting wasn’t selling a new kind of coffee. In fact, all of the cold brews and other drinks that day were free. Instead, the real sell was showing how blockchain can be used to keep an eye on beans as they travel from farm to cup. Working with IBM, Brooklyn Roasting is tracking its Ethiopian Yirgacheffe coffee beans from the Banko Gotiti co-op in Ethiopia where they’re grown to where the beans are brewed in Brooklyn. A bean’s journey from farm to cup can sometimes pass through dozens of transactions—after a farm, it enters a mill before going to a broker before being shipped. And along the way, if a bean needs to be certified as fair trade or organic, there might be additional steps to make sure certification is issued properly. Of course, coffee roasters that rely on these routes for quality and ethics reasons have their own processes in place. But what if someone were to switch out the beans for a bad batch somewhere along the way? “When we say this is a fair trade certified coffee and brag about it, we need to know that it is, and that’s hard when you’re talking about transactions that happened three months ago and 10,000 miles away,” said Brooklyn Roasting CEO Jim Munson. By putting the Yirgacheffe beans on the blockchain, Brooklyn Roasting and IBM are able to track and confirm the identity and authenticity of beans at each step. Brooklyn Roasting and IBM are just the latest companies to explore how blockchain can help the coffee world. Denver’s Coda Coffee boasted it was the first roaster to hop on the blockchain back in April. Starbucks, too, has been experimenting with the technology to track its beans. Munson said setting up a preliminary blockchain has given him more insight into the commodity in the past few months than it has in two decades. The process of setting up Brooklyn Roasting on IBM’s blockchain took about two months and was built as a demonstration that could be later scaled for other beans or other companies and their own industries, according to Ann Rubin, vp of marketing at IBM. To help explain the technology, IBM recorded several videos that describe various parts of the blockchain. Then, when a visitor received their coffee, it came in a to-go mug that was also connected to the blockchain, along with a QR code that allowed them to scan it and see where their coffee came from and show that they were now part of the blockchain. In a way, IBM is hoping to do for blockchain technology what it has done for artificial intelligence: take a new, complex, abstract technology and make it more comprehensible for the masses. Over the past few years, IBM has sought to market its Watson AI technology through various lenses within pop culture. It partnered with Bob Dylan to show how AI can analyze words, it created a sculpture based on Gaudi’s paintings to show that AI can analyze photos and designs and it partnered with major sports events, including the U.S. Open, to show how AI can follow events and pick out key themes. So how successful were IBM and Brooklyn Roasting in educating visitors? When asked how to describe blockchain technology while waiting in line, some were more knowledgeable than others. Everyone knew at least something, ranging from what the technology does to how it’s being used with coffee. “Basically, the blockchain is tracking the bean from Africa to where we are now, so each block on the chain has different data,” said Catherine Bracken, who said she doesn’t even drink coffee. Perhaps two of the more creative explanations came from a pair that had just received their coffees. Owen Chen said he doesn’t work in the blockchain space but first heard about it back in 2014 and had taken a computer security class where he learned about its various functions. With him was Cristina Fernandez, who said she learned about blockchain from TV personality John Oliver, who did a segment about blockchain a few months ago. After that, she talked with her friend that works in the blockchain sector and was able to ask questions. However, as even industry insiders can attest, it’s not necessarily the easiest tech to describe, often analogies and metaphors are created to describe the emerging sector. Standups Stand Up to Cancer at BRC, You Can Too.